“Think quick, act fast, text your reflexes” – that’s the modus operandi of the Reflex game from Lakeside. The game consists of a multi-coloured, hard-plastic game board, wireframe, set of dice, and two yellow “scorers”. After assembling the board, players place three dice on the game’s “kicker ledge” with any combination facing up. Play begins with one player predicting a combination of numbers or colours that the dice will land on. For example: “a total value of 12 or over”; “green and red”; or, “a value less than 10, red and black only”. After announcing the combination, the player presses the yellow “kicker lever”, causing the three dice to fall into the enclosed area below. Players must quickly assess the result. 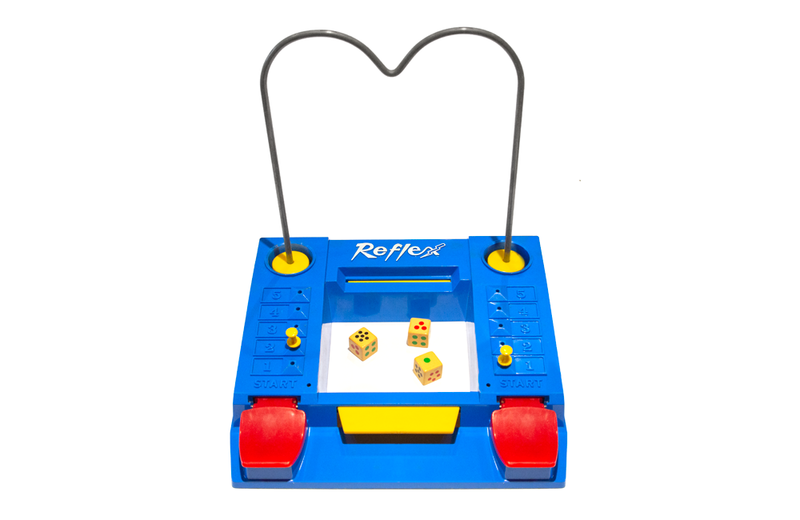 If the dice combination matches the player’s guess, the first player to press their red lever and propel the yellow scorer to the center of the wire frame scores a point. If the combination doesn’t match the player’s prediction, things are even more exciting. In that case, either player may fake a move towards hitting their lever in an attempt to get the opponent to hit theirs first. If the trick play works, the opposing player receives a point. The first person to score five points is declared the winner. The Reflex game enjoyed a short three-year life span. Graham Hancock, LEGO collector and deputy editor of Blocks magazine, examines one of the most widely recognized LEGO building kits from the iconic manufacturer. In the 1970s, creativity met “Big Iron” in the Play ‘N Learn Computer from Playskool. Patterned after mainframe computers in use at the time, the toy was helped children with basic math, spelling, and matching skills.